Mobile Health Computing: HTC Flyer: An Android tablet with a "Magic Pen"
HTC Flyer: An Android tablet with a "Magic Pen"
The HTC Flyer is an Android slate tablet that includes a "magic pen" that will allow you to write, draw, and "ink" more accurately than most other slate tablets (with the exception of slate tablet PCs running Windows 7). With these smaller tablets that include both a capacitive touch screen an some sort of active digitizer, we're seeing more devices using the DuoSense Digitizer Solution from N-trig. My HP Slate 500 uses an N-trig pen and the new Fujitsu Q550 also uses an N-trig pen. The Motion Computing CL900 also uses the same type of pen. Why the movement away from Wacom? Before you go out and purchase an HTC Flyer, check to see if the device comes with a "magic pen." Otherwise, you may be spending $30 or more to purchase a separate pen. 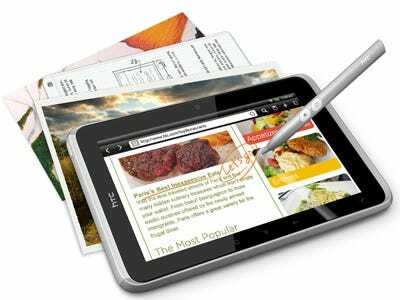 The HTC Flyer is a portable 7-inch tablet with a magic pen that can do more for you than you can imagine. From creating masterpieces with a stroke of a paintbrush, to taking multimedia notes or even signing digital documents, HTC Flyer puts you in control of any situation. With streaming movies at a touch of your finger, HTC Flyer turns any moment into something special.